National Anthem signals the start of the second annual police versus firemen fundraiser hockey game. 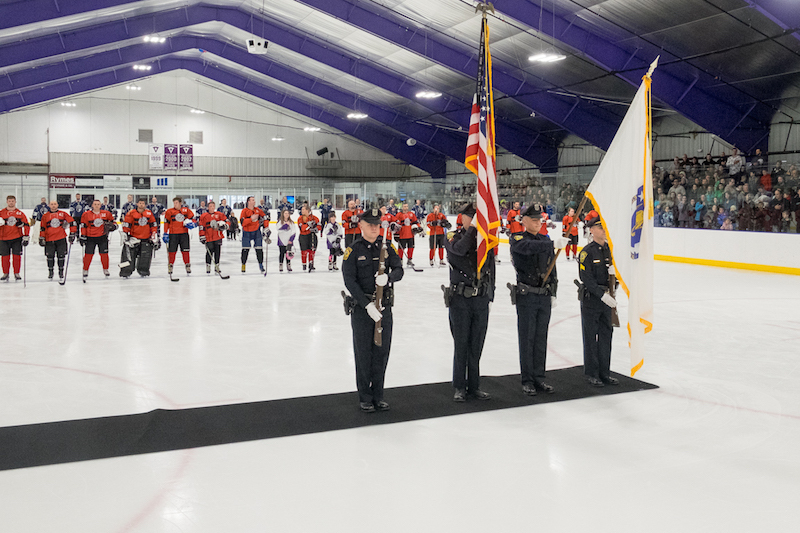 Vineyard police solidified their hockey dominance over Island firefighters with a 9-1 victory at the second annual Guns and Hoses event at the Ice Arena on Saturday evening. The game appeared to be rout until the final minute when, in a curious repeat from last year, the scoreboard magically changed to a 9-9 tie. 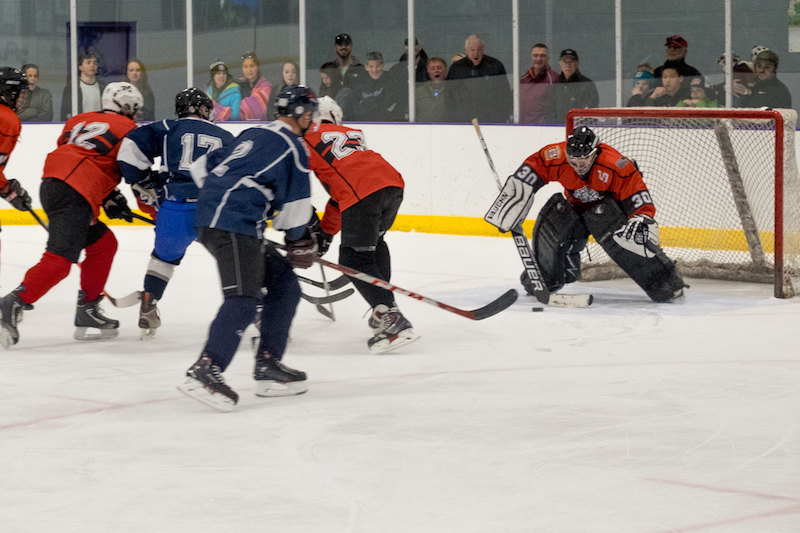 A penalty shootout was called for where an ace shot by Edgartown police officer Zach Townes clinched it for Blue. The stands were packed with hundreds of residents of all ages decked out in emerald sweaters and shamrock flair to commemorate St. Patrick’s Day. 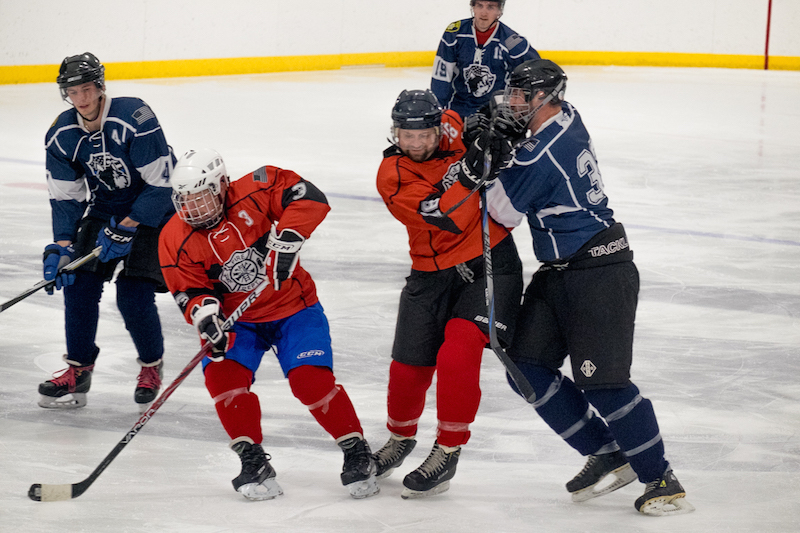 Team Fire had the most enthusiastic supporters, with the biggest cheers erupting after Oak Bluffs EMS officer Belle Dinning, one of the few women on the ice, scored the Red team’s only goal. Though bragging rights were on the line, the reason for the matchup transcended rivalry. The event raised over $9,000 for Vineyard House, a nonprofit that provides housing for Island men and women in the early stages of recovery from alcohol and drug addiction. The partnership was the brainchild of Tisbury police detective Max Sherman, who told the Gazette that addiction on the Island is an epidemic and he was glad to find a way to help raise funds for a cause that helps fight back. “We deal with addiction on a day to day basis,” said Detective Sherman. Kate Desrosiers, executive director of Vineyard House, said she was more than happy to work with the Island’s bravest. 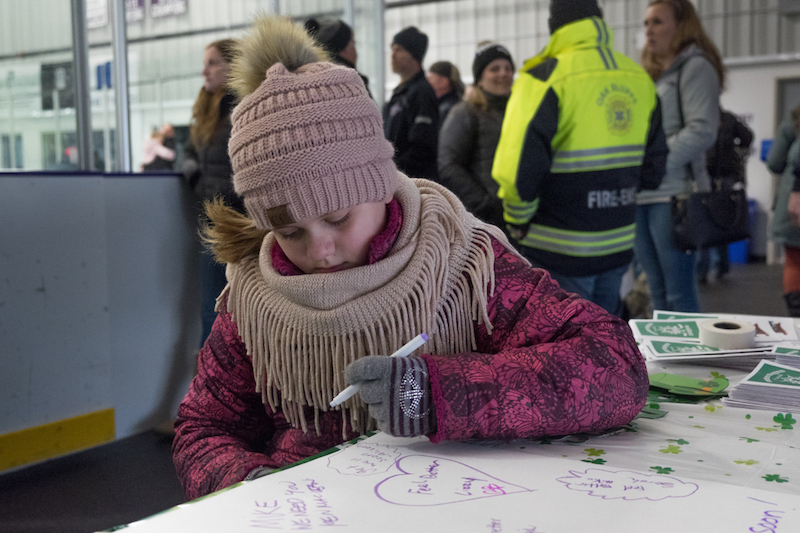 Members of both the police and fire teams also raised an additional $500 for youth hockey programs at the arena, according to Oak Bluffs fire EMS lieutenant and event organizer Trulayna Rose. A public skate before the game raised over $6,000 in skate rentals and donations to cover medical funds for Mike Hathaway, deputy Edgartown harbor master and beloved Zamboni driver, who was seriously injured when a boat fell on him in an accident earlier this week. Mr. Hathaway is still recovering at Massachusetts General Hospital from a femur injury and compression fracture to his spine, but is in high spirits and cracking jokes, according to his sons Chris and Nicholas, who attended the game. Nick said they told Mike about the huge turnout and that Mike has been beside himself with gratitude for the community’s support. “It just shows you what kind of community we have,” added Chris. The fundraiser was organized by Ryan Gosson who also drives the Zamboni at the Ice Arena. He said that money is still coming in and it’s all thanks to a support of the community. Members of both the police and fire department echoed Mr. Gosson’s sentiments and told stories of Mr. Hathaway’s selflessness and kindness. Officer Sherman said that Mr. Hathaway used to give him a fist bump before every high-school hockey game he played in. Oak Bluffs fire chief John Rose said Mr. Hathaway has always been polite and professional with him, and would do anything for a fellow Islander. Denitsa Alton, a financial clerk at Oak Bluffs elementary school, brought her two kids Tyler and Jason to the skate. Though she said she doesn’t know Mike personally, she was glad to participate in the fundraiser as a member of the Vineyard community. “The best thing about the Island is when the community comes together when members need help,” said Ms. Alton. As she spoke, Tyler and Jason were out on the rink gliding and sometimes stumbling on the crowded ice. Ms. Alton said that both just started an instructional hockey program at the arena, the very program where Mr. Hathaway is often seen high-fiving kids while he drives the Zamboni around the rink, and giving them a fist-bump with a big smile before they take the ice. Donations by cash or check are still being accepted for Mr. Hathaway and can be dropped off in a donation bucket at the Ice Arena during open hours. Donations can also be made by calling the ice arena at 508-693-5329. Yes Hal Flack. Mike Hathaway and I went to high school together in Newark DE and my family has had a Vineyard cottage since 1982. I'm going up there this week to be with my mom. How can we contribute? I was going to call up Mike and hang out and I just read this.